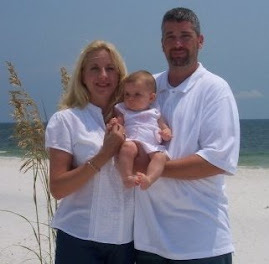 A Blog about the Jennings day to day lives. Something has been on my mind for the past week. Ever since becoming a mother, I view children differently. Not that I had a negative view, or even an overwhelmingly positive view for that matter, of children. It's like, suddenly, you have motherly feelings for all children. OK, not ALL children...but mostly. And, because I am a mother, I have a different view of most things now. Whereas before, illness came and went without a thought. Now, it's completely different. And I don't mean when I get sick. I mean, when a child gets sick. I was so torn up and my heart hurt last week when Emilee was sick. There wasn't much of anything I could do to help her. She is too young for any medications, so we got to try saline nose drops and a humidifer to try to beat a cold. She was so miserable and so sad. She would look at me with those eyes pleading to make it better, and I couldn't. I know you parents know exactly of what I speak. And Emilee only had a cold. What about those pumpkins that have cancer, MS, Muscular Dystrophy, lymphoma, and other illnesses? My heart breaks for them. Childhood illnesses are so cruel. I know in my lifetime, there will continue to be all these illnesses, and probably through Emilee's lifetime. Will there be cures found? If I win the lottery, I will give it to research these awful things. ugh, a depressing post. my apologies. On a positive note, Em is feeling a 1000 percent better. I had my monthly checkup today. Heard the baby's heartbeat. Fast and strong. My main concern was the flu shot. When I asked Diane (the nurse) about getting the shot, she said "which one? the seasonal or the H1N1?" Dang, now I had to make a decision. I wanted only the seasonal, but knew, since i am pregnant, I needed to get the H1N1. And I KNEW what J would want me to do, get both. But I had/have serious reservations about this shot. Something the government is providing/pushing, and is FREE? It was rushed to the market. It is so new. Legislation was created to protect the makers in case of the worst. Not enough is known. etc. But I am in one of the high risk categories. And there are lines of people waiting for the shot when it comes available all around the country. And there it was, for the taking. I found it discomforting that every healthcare worker I asked in the office this morning had not gotten the shot. With answers like "I will wait a bit" and "Not yet" and my fav, when asked what she suggested, Diane said "I got the seasonal." And left it at that. If the healthcare workers aren't jumping at the chance to get it....why should we, the guinea pigs? So what to do? I talked at length with Dr. Thornburg, who told me what the AMA and Women's groups and all the other doc groups were saying: Get it. She asked my reservations, I told her, she assured me it is made the same way the seasonal is made, etc. I got it. Gut feeling tells me i shouldn't have. I hope I am wrong. If it were just me, I would risk it this winter. I am not in the age group of concern. But I have a baby at home. And one in the oven. I have to think of them. Now both arms are sore because one went in the right, one went in the left. While I was a bit concerned she was underweight after seeing this chart, Dr. Lalonde assured me this is a great percentile to be in. With childhood obesity on the rise, we all need to be careful of our childs eating habits. And yeah, she is tall. 90th percentile for height. Anyone surprised. yeah, us either. She also had a flu shot, but no other vaccinations were due at this time, so this was the only poke this time. She is also crawling like a champ, pulling up on everything and decided yesterday she wanted to climb up the stairs. She did so without a tumble. Only 2 weeks of being mobile, and she is going, going, GONE! Delay in posts due to illness in the house. Last Saturday, Emilee came down with a stomach bug. She was sick all Saturday and Sunday. Then I began to notice a little cough. Her stomach bug morphed into a cold. And guess who else got both? you guessed it, me! Monday I got the stomach bug, followed closely buy the same cold. We were miserable. There isnt anything you can give a 9 month old that helps other than saline nose drops and setting up a humidifier. Same goes for a pregnant woman. There is veeery little one can take. But, being in the 2nd trimester, I was able to take a cough med and some tylenol products. But, as all you parents know, there is no such thing as a sick day for parents when there are children involved. John came home early on tuesday so we could take her to the doc and stayed home with us Wednesday. I am just now starting to feel better. one week later, and still not 100%. boo. Well, looks like Emilee is onto something new and different. Since Monday, she has been awake and fussy all night. Many think it may be teething. Some say it's a phase. Whatever it is, we are all exhausted. I feel bad for the tyke. Something is bothering her. Trying to narrow that down is pretty difficult. All my facebook friends have been so helpful with advice, comments, experience and support. I LOVE FB! Ugh, why am I blogging? Should be resting. Will I never learn? ...I think. I enjoyed a quarter pounder with cheese and fries, large of course, today. I was so glad to be eating I didn't feel any guilt. And I had lost weight during the sicky-blech-ness. So, mmmm mmmm!! 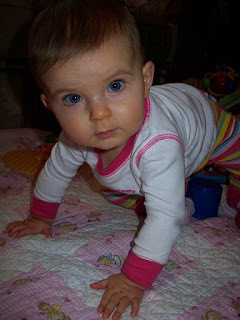 Emilee is still on her quest to perfect her crawling. It really is quite cute, but gone are the days of sitting and watching her play. OY, does my back hurt from chasing the pumpkin around. But its all ok. Trying to decide on portraits...when, where, who, etc. ideas? Emilee began her journey of being mobile yesterday! She began crawling like nobody's business. When John saw it last night, it made him tear up! Our pumpkin is determined to grow up. harumpf! On other big news, I let the cat out of the bag and began telling people. The news is my current fb status. If you want everyone to know something, post it online! ha!